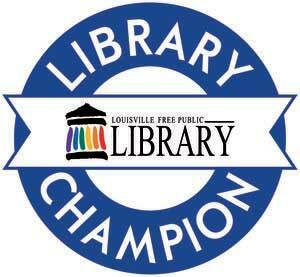 The Foundation’s Library Champion Program offers the opportunity for local businesses and organizations to support the Louisville Free Public Library’s programs and collection enhancements that would not be possible without philanthropic funding. The Library Foundation’s contributions support LFPL’s efforts to impact our community and transform quality of life through education, civic engagement, the arts and entertainment. Annual unrestricted gifts to the Library Foundation are essential for the Foundation’s ability to support the library’s mission and vision as a passionate advocate for literacy and lifelong learning. Please join our community in supporting the LFPL through the Foundation’s Library Champion Program. Additional opportunities for recognition are based on the level of support as outlined below. $10,000+ — Title sponsorship of one VIP reception preceeding a Craig Buthod Author Series event and 25 invitations to the event. Recognition in two editions of LFPL’s bimonthly newsletter. Recognition on Foundation social media six times per year. Nameplate inside 15 books. $5,000-$9,999 — Sponsorship of one VIP reception preceeding a Craig Buthod Author Series event and 10 invitations to the event. Recognition in two editions of LFPL’s bimonthly newsletter. Recognition on Foundation social media six times per year. Nameplate inside 15 books. $2,500-$4,999 — Recognition in one edition of LFPL’s bimonthly newsletter. Recognition on Foundation social media four times per year. Nameplate inside 10 books. $1,000-$2,499 — Nameplate inside 10 books. $500-$999 — Nameplate inside 5 books. Newsletter distribution: 16,500 per issue; includes Foundation annual report enclosure once per year. Electronic edition reaches 63,000 monthly. Craig Buthod Author Series averages 190 attendees per event. Download the enrollment form here, or contact Chandra Gordon for more information.